Adventurous anglers are richly rewarded in the Porcupine Mountains and Ontonagon County. While you can reach some fishing spots easily by car, some of the most memorable fishing in the Porkies involves a bit of a hike. These wild rivers, roaring streams and pristine lakes are teeming with fish and can be reached via a picturesque hike. Sometimes the journey to the water’s edge is half the fun. Here are three great spots to cast a line. This iconic lake offers more than spectacular views. Hike to the lake’s edge and you’ll find some beautiful backcountry fishing – the lake’s stock includes smallmouth bass and perch. There are some regulations in place to protect these calm waters. It’s a catch-and-release lake and anglers must use artificial lures. You can bring in a light watercraft, if you can carry it in via a ¾-mile hike. It’s worth fishing here, despite the challenges. Where else can you experience fishing in the clouds? This river travels 42 miles through the forest over a series of falls, flowing through the Porcupine Mountains Wilderness State Park before emptying into Lake Superior. Trails flank both sides of the river, enabling you to reach beautiful waterfall vistas as well as some secluded pools to cast a line. If you’re looking for trout, head to this river – it contains brook, brown and rainbow trout, as well as walleye, salmon and northern pike. This is a true backcountry fishing experience and worth the extra effort to find. Mirror Lake is a remote lake, deep in the Porcupine Mountains Wilderness State Park. Every way in involves a hike. The lake can be reached by several trails, including the South Mirror Lake Trail, the Little Carp River Trail and the Correction Line Trail. When you arrive, you’ll find calm waters that contain splake and brook trout. 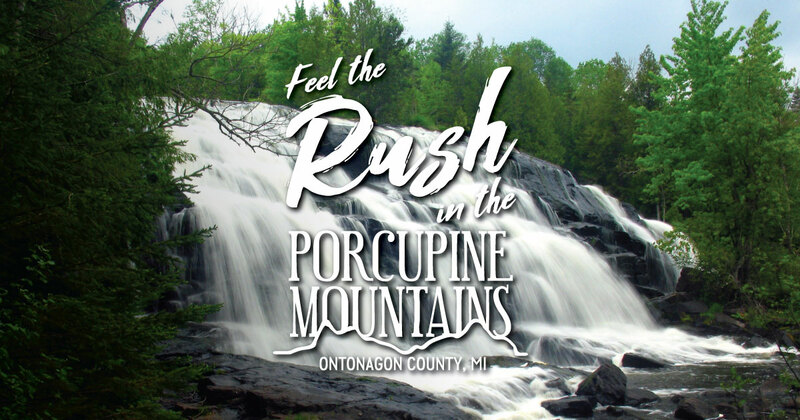 Learn more about fishing in the Porcupine Mountains and Ontonagon County.